HOHENFELS, Germany — The U.S. Army successfully completed a project to repair and improve the existing flood prevention system for the access road between Hohenfels Training Area, or HTA, and the off- post community of Hohenburg. A few decades ago, soil compaction caused by military vehicles caused heavy flooding in the idyllic Hohenburg area, located in the Lauterach valley on the northern side of HTA. Since then, the Army has invested around $10 million on structural flood prevention on HTA to prevent further damage and to maintain training land. The Army constructed rain water retention ponds that collect surface run-off, dams and wooden and stone barriers, known as swells, to slow down the flow and prevent flooding. Ninety of those structures are in place on HTA to protect the towns in the Lauterach and Vils valleys from being flooded. Earlier this year, the mayor of Hohenburg, Florian Junkes, approached the Army with a request to repair existing structures and improve the surface water run-off at the HTA access road in Hohenburg. Heavy rainfall repeatedly washed out the gravel road in this area, depositing gravel on the community-owned asphalt road and blocking road gullies. The Army took action by implementing remediation measures that fixed the situation on-site. 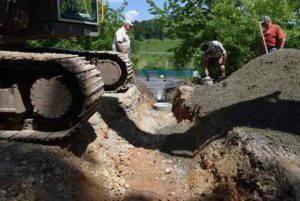 New drainage trenches, swells, rainwater retention and seepage basins were constructed in coordination with the local community of Hohenburg, the Federal Forest Service, the U.S. Engineering Division and the USAG Bavaria Environmental Division. The completed project received very positive feedback from both U.S. and German stakeholders, as outlined in the German newspaper Mittelbayerische Zeitung. A well-maintained training area and a preventive approach are extremely important for supporting unimpaired training rotations that ensure Army readiness and furthering good relations with the host country. During the planning process of HTA projects, a multitude of possible scenarios are evaluated to prevent future flooding. One scenario involves an increase of rotational units that training on HTA. The increased number of heavy military vehicles could cause severe soil compaction, which ultimately leads to higher volumes of run-off. In this situation, water retention basins, canals, swells and other similar measures are constructed to hold and channel large amounts of water. The newly-installed, well-designed flood prevention structures are state-of-the-art and are expected to last for decades to come.